Making, crafting and growing herbal remedies for everyday use. I am a truly blessed woman. The process of building my website and writing and blogging about herbs for the last 7 years has let me experiment, taste, grow and learn about medicinal plants while making a living. I am profoundly grateful to all the readers of this website for helping me realize this dream. When I first started my goal was to profile 50 herbs, those "sweet herbs" in the classic sense, who have essential oils. But I kept finding one more, and one more and as time when on my list soon swelled over a 350 different medicinal plants. The advent of the internet has opened the door to even easier access to the exotic herbs used worldwide. I realized a long time ago that I will never run out of new and interesting herbs to profile on this website, of new and old herbal remedies to test, refine and post in the database. So the problem becomes one of an abundance of wealth. How to choose between all of these fascinating, healing, and wondrous plants to recommend to you, dear reader for use in your home. The method I settled upon was this. If I were to make up a basic package of herbs, teas, oils to give to friend, with simple instructions for use, not wanting to overwhelm them with learning about the properties and actions of 300 different herbs, these are the ones I would choose. If you were to ask me, out of all the remedies posted on this website, which ones do I use myself in everyday life, these are the ones. "Kitchen medicine" profiles forty-four of the most popular and useful healing plants with easy to follow instructions on how to use them. These herbal remedies take you step by step on how to blend tasty and effective herbal teas, create your own custom herbal oils and salves for health and beauty, and use essential oils to kill germs and infections as well as emotional healing. A hot pepper can cool off psoriasis and ease the pain of arthritis..
An old fashioned red tea that can lower blood pressure..
Common kitchen spices can help prevent cancer.. Tropical secrets of Coconut oil for beautiful skin and hair.. Which potent antioxidant is hiding in the tomato sauce..
and much, much more. 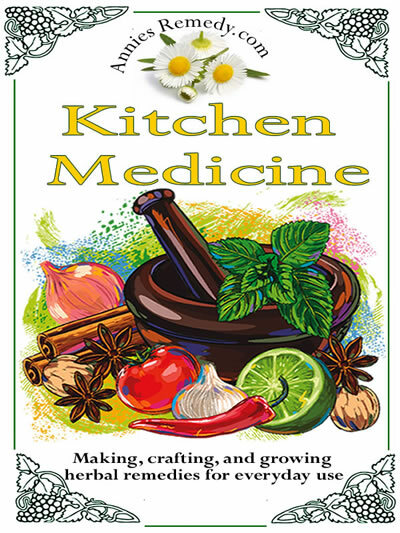 Kitchen Medicine contains over 60 of the best herbal remedies, ones that cost little to nothing, use familiar, easy to acquire ingredients, are not complicated to use, and most of all they work. What is Kitchen Medicine? Some things are plainly food like potatoes, although they can be used in home remedies, (raw slices on black eyes). Their main function is to provide carbohydrates and some minerals in our diets. Some things are plainly medicine like aspirin, though its beginnings were in nature as an extract of white willow bark.� Some things are harder to classify, and occupy that place where food and medicine intersect in our lives to become one and the same thing. Cayenne pepper is food, but also contains a powerful pain reliever, onions and garlic are antiseptic as well as tasty; celery, grapes, apples, and oats all have the capacity to heal as well as nourish. 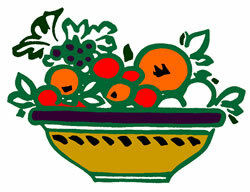 Food is medicine, and our medicines should for the most part be food. Herbs combined with a bulk, organic items like vinegar, olive oil, and beeswax are the ultimate practical persons answer to living a good life on a limited budget, and help us to make the best use out of what we have. Because of my work I keep a large inventory of dried herbs, medicinal oils and essential oils in my kitchen, which doubles as my home apothecary. The kitchen is the true heart of the home, and the center of operations of the home herbalist who does not recognize the artificial dividing line between food and medicine. Over time I noticed that the herbs I used most often tended not to be the exotic ones, but to be the most common and inexpensive ones, like peppermint, cinnamon, and ginger. Out of the thousands of possibilities, these core group of herbs are the ones I can't live my life without, the ones who get used the most, end up in my tea cup the most often, the ones who prompt an order to my wonderful supplier when they run low. Bonus points are awarded to those plants who will grow in my back yard garden. These are the herbs that in many cases have inspired me to go to botanical gardens, peruse seed catalogs, and break the earth in the spring to plant them in my back yard. The visitors to AnniesRemedy.com seem to agree. With all the world to choose from in this age of the internet, the most popular and most searched for herbs by our website visitors are parsley, sage, rosemary and thyme (The Scarborough fair herbs). Coconut oil, lavender, calendula, ginger, and cayenne pepper are also among the very popular and practical herbs you will learn how to use in this handy e-book.